Well folks, the eve of the new year is upon us. For some it’s already here. For everyone I wish you a happy, healthy and prosperous new year. Though, before we get too carried away with the revelry I think there’s still time for one last cocktail. I’m going to take a quick look at the Violet Fizz from The Bubbly Bar as I promised earlier in the week. Reading the recipe for this drink in the book it sounded really good. Plus it’s a twist on the Ramos Gin Fizz, one of my favorites. Mixing up the drink I ran into a few problems, but nothing that some recipe tweaking can’t handle. First, I don’t have Monin violet syrup. I do, however, have a bottle of Creme de Violette that would be delightful here. Second, I don’t have any prosecco on hand and I’m comfortable enough to admit I’ve never heard of sekt. After a bit of googling it seems that sekt is the German word for sparkling wine. Now you know. (I’ll let you insert the G.I. Joe reference) Not to worry, I’m sure the Gruet Brut I’ve been mixing with this week will work fine. Third, I don’t think the Creme de Violette adds as much sweetness as the Monin syrup would. In my subsequent attempts I added a bit of simple syrup which sorted that problem out nicely. Finally, my drink didn’t come together nearly as well as the one pictured. When I poured the shaken components into the Champagne, I ended up with about six ounces of foam. Not optimal. I switched up the method and mixed it like you would a Ramos Gin Fizz. 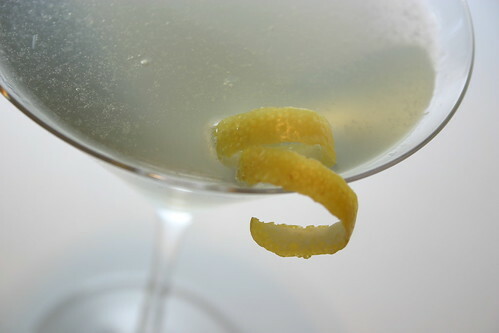 I mixed the ingredients, poured them into a collins glass and topped it with the Champagne. Same result, way too much foam. I tried reducing the amount of egg white I added to no avail. Simple enough, I just dropped the egg white all together and moved on. Now that you’ve patiently read this rambling story I’d like to make a point as to why I wrote it all down. When you’re looking at cocktail recipes and you don’t have the exact ingredients needed or don’t like the results, improvise! Whatever you’re mixing should make you happy first and foremost and only after that adhear to classic recipes. Cocktail recipes, as with those for cooking, are just guidelines after all. So there you have my recipe. I have to say, I really enjoy this drink. It’s reminiscent of an Aviation, another favorite, which is definitely not a bad thing. The color is a light sea green and the Creme de Violette gives the aroma a very delicate floral note. The flavor is really well balanced and harmonious, with each ingredient coming through. Note that I opted for a delicate gin as the original recipe suggested. Good call. Too much punch from the gin would overwhelm the Creme de Violette and Champagne. Finally the effervescence from the Champagne is really refreshing. Happy New Year all. Enjoy your drinks tonight.